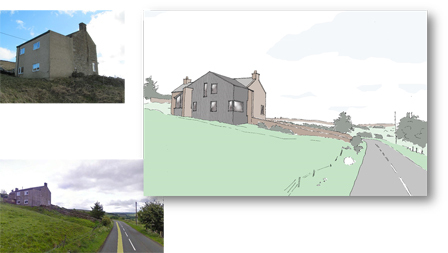 This original small traditional upland farmhouse was extended on its north elevation many years ago with a two storey, rendered flat-roof extension which is very visually dominant and somewhat out of keeping within its Area of Outstanding Natural Beauty sensitive location. The new owners wish to make this their long-term home but a large part of the house is aesthetically unpleasing and the solution proposed, particularly with regards to cladding of the ugly rendered extension, mitigates the harm caused by previous generations. 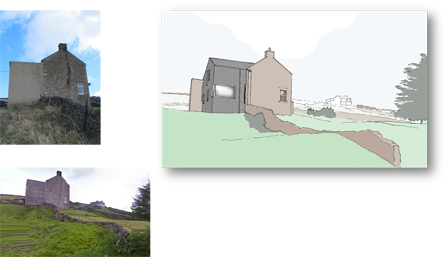 Planning approval has been granted. A low energy building will result through the reuse of existing fabric, use of highly insulated external cladding, internal insulation, and better day lighting, together with 13 linear photovoltaic panels. 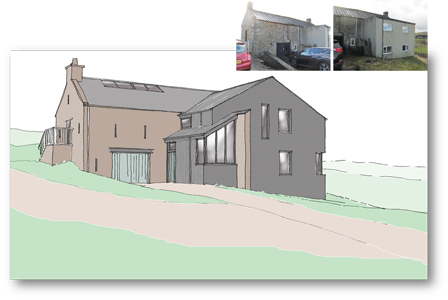 The planner said in her report that the design of the extension is innovative and respectfully modern, easily recognisable as such, contrasting well with the stone farmhouse whilst remaining subordinate to it.